Illingworth St Mary’s look set to become one of the widest-margin winners in the Halifax AFL’s recent history. The side based at Trinity Academy have a 17-point lead over second-placed Northowram, who have finished their fixtures, after a 6-0 win away to Midgley United on Saturday. Gareth Gaukroger scored a hat-trick for Saints, Michael Gregory got two and Ben Field the other. In recent years, Hebden Royd Red Star won the title by 17 points from Elland United in 2010/11 and Stainland United by 14 from Red Star in 2006/07. Saints finish their Premier Division programme away to Ryburn, who can still take second place, on Saturday. Ryburn were 5-0 home winners against Calder ‘76 at the weekend. The visitors were returning to the scene of their title-clinching win 12 months earlier but this time they blew their hopes of finishing runners-up. Nathan Hargreaves, Joe Swallow, Owen Wilkinson, Will Hirst and an own goal accounted for Ryburn’s tally and the scale of the defeat meant Rob Kenworthy’s visitors slipped to third, below Northowram on goal difference. Chris Garbutt confirmed he was staying on as player-manager of Hebden Royd Red Star, who have finished seventh in the Premier after a 2-0 home win over next-to-bottom Shelf United. Both goals came in the first half when players went through one-on-one with the Shelf ‘keeper. Tom Barclay applied a lobbed finish for the opener after about 20 minutes and Garbutt slotted the second 10 minutes later. The Division Two programme was completed by two matches and they both resulted in home wins. 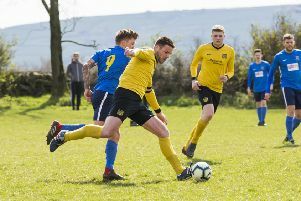 Junction Inn shook off the disappointment of narrowly missing promotion with a 4-2 home win over Sowerby bridge Reserves. Their goals came from Jamie Rice, Matthew Spink, Aaron Barkham and Kris Gorringe. Adam Fenton and Peter Howard replied for Bridge. Josh Norcliffe scored a second half hat-trick as Shelf United Reserves consigned Salem Reserves to bottom spot with a 6-2 win at Lightcliffe Academy. Louy Kenny and Jay Thomas scored for the visitors.